I am blessed to have some mighty crafty friends. Ladies night for some people might involve cocktails and high heels, mine involve plenty of cocktails (in this case champagne punch) just instead of heels we have on comfy shoes, aprons and are wielding hot glue guns. 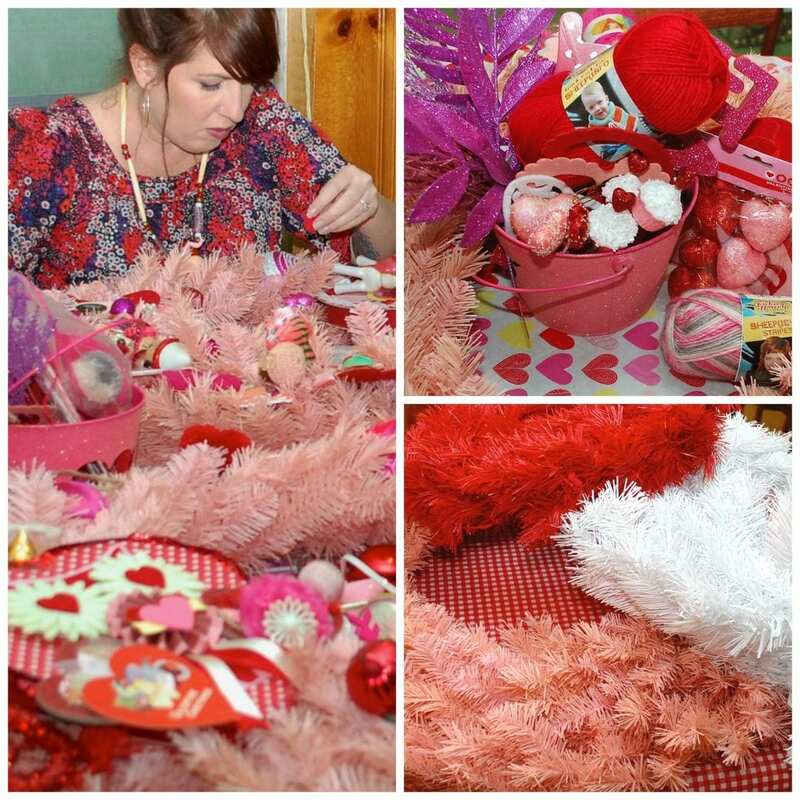 Recently I got together with a few of my friends to have a Valentine’s wreath making party. 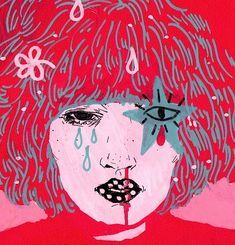 I don’t know how many sticks of hot glue we went through in the 5 hours we spent on our feet laughing, talking and crafting – but it was a lot. The end results were worth any glue gun burns. As the brand ambassador for Treetopia my friends had a connection on the inside. I showed up with 6 gorgeous wreaths to share. I thought there might be a a serious round of rock, paper, scissors to see who got each wreath but in the end they all went to great homes. 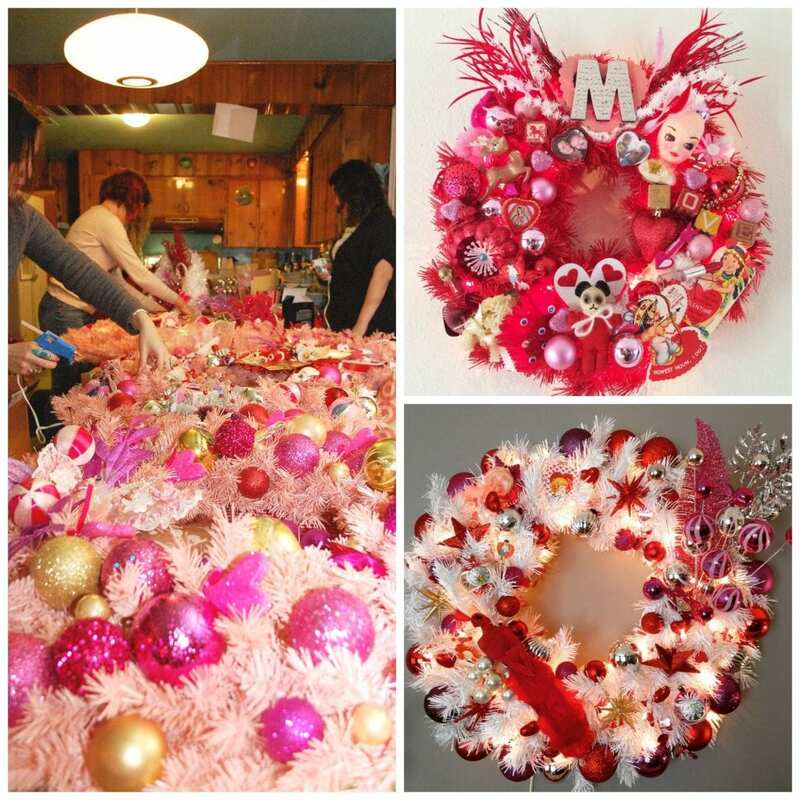 Most of us went in to the wreath making process with the mindset of go big or go home. In other words we wanted LOTS and LOTS of stuff on our wreaths. Hence the copious amounts of hot glue. Everyone brought oodles of pink, red and white supplies to share. 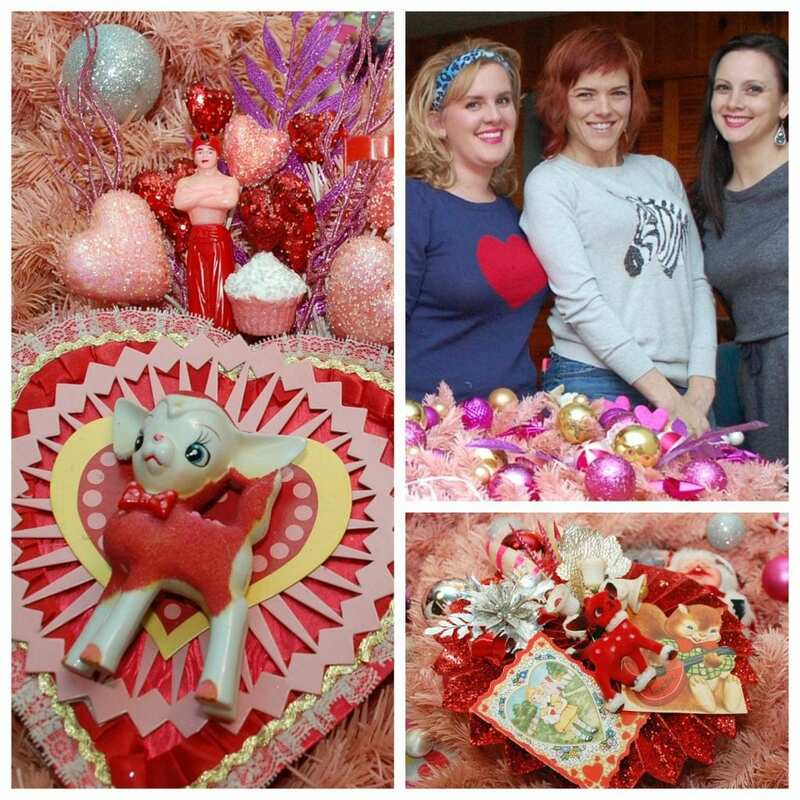 The tables were covered with pink Christmas balls, red heart shaped yarn pompoms, glittered doilies and even a ladies razor and false teeth. I’ll get to that part in a few minutes. 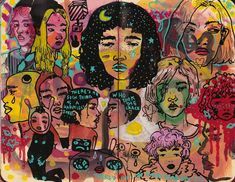 If you think this sounds like your kinda party, read on! Here is a quick and easy supply list of some basic things to have on hand for hosting your own Valentine wreath making party. 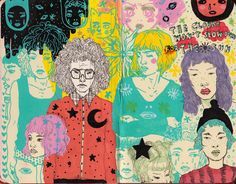 – Anything red, white or pink you can get your hands on. The wreaths varied in size from 24”s to 36”s. 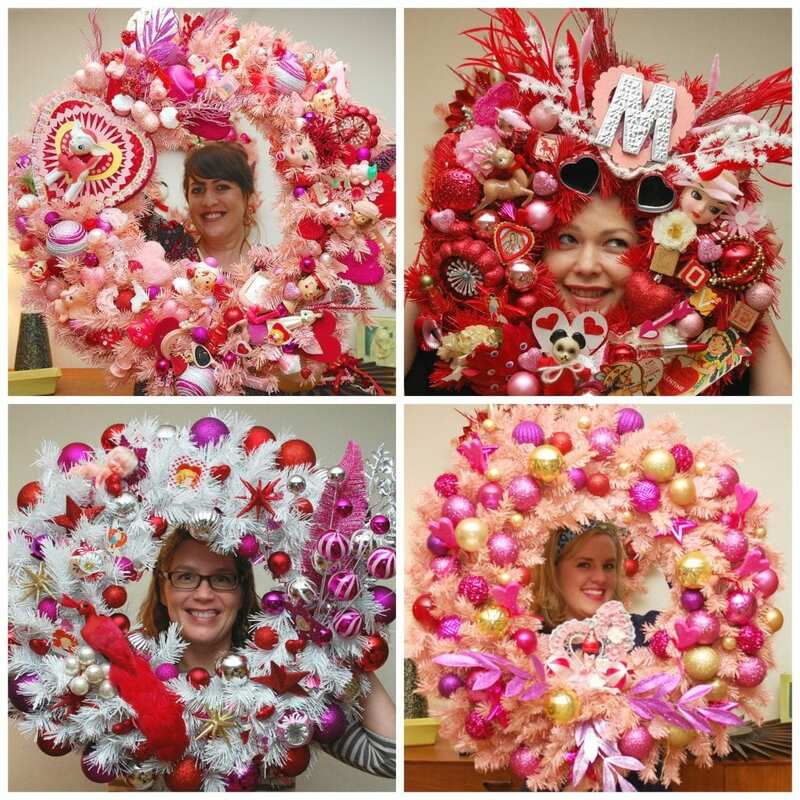 The four of us with the large pink wreaths were a bit intimidated at first, but we took the crafty challenge on head first. My pearl of wisdom when designing a wreath is to start with your focal point first and work out. It’s like decorating a room, once you have your anchor piece everything else will fall into place around it. I used a large vintage heart shaped box that once held chocolates. I embellished the box with a flocked ceramic deer and from there all the other pieces of my wreath came together. After you have your centerpiece in place, think filler. Fluff your wreath first and foremost. Make sure the branches are were you want them and then start gluing in the background layer. For me filler was random shiny Christmas balls in Valentine colors. I spread these throughout my wreath. I also sprinkled around the occasional felted wool heart, glittered cupcake and other random supplies from the craft store. I wanted to save my more special vintage items for the top layer. Speaking of special this is where the razor and teeth come in. 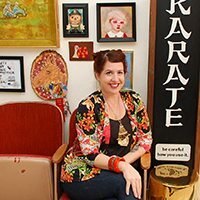 I was a jewelry designer with a line called Naughty Secretary Club for years. I specialized in unusual vintage elements in my pieces. 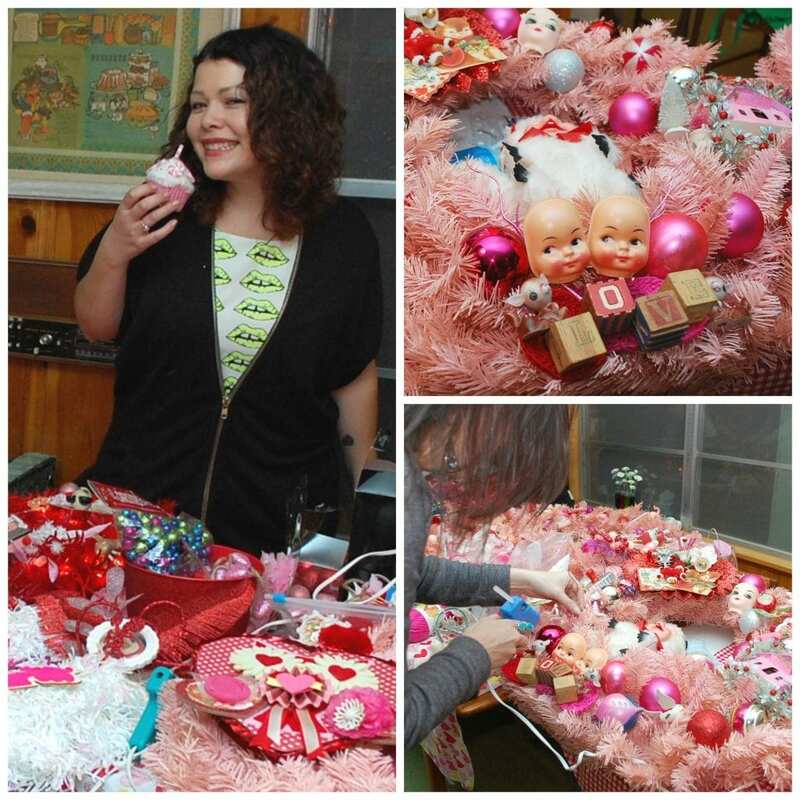 I still have a garage full of kitschy bric-a-brac that comes in mighty handy for things like decorating a Valentine’s wreath. I keep my kitsch sorted by color which made for an easy selection process. I went for toys and trinkets that were red, white or pink. I tried to focus on larger items like vintage children’s sunglasses, small dolls and cupcake toppers. I found the best thing for me was to decorate a small section of the wreath at a time making sure all my colors were represented and the occasional extra heart was thrown in so that the Valentine’s theme was not lost in the translation. Eventually all my small sections met up. 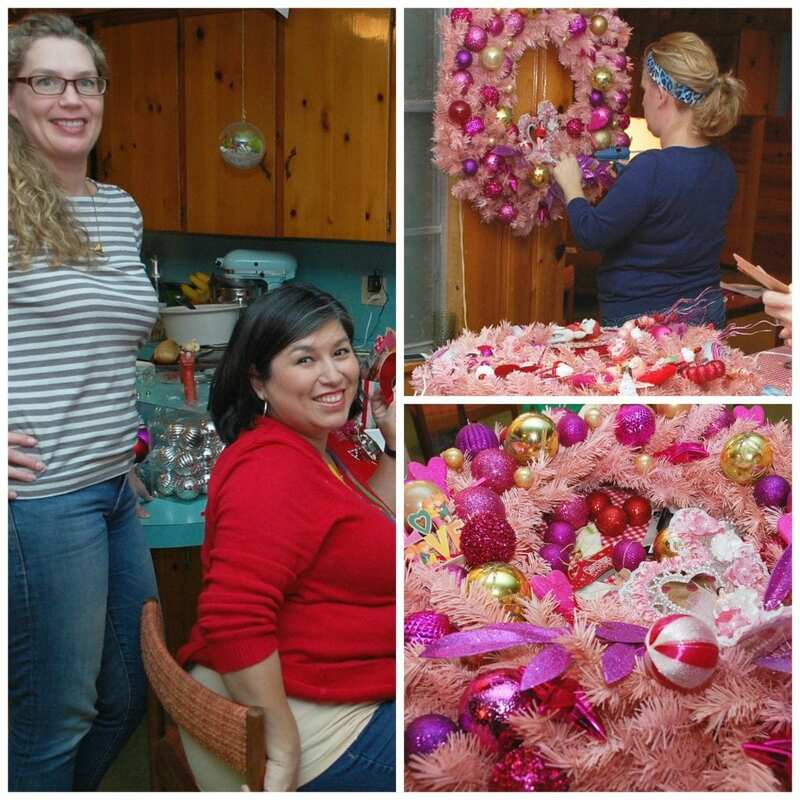 One thing we all discovered when working with our wreaths laying flat on a table was that when they were actually hanging on a wall or door things looked different. Not always in a bad way, but occasionally hanging your wreath through out the process will give you a different perspective. What looks great laying flat on a table as your craft might not look so hot when hung on the wall. Hanging will also help you spot any holes in your design. 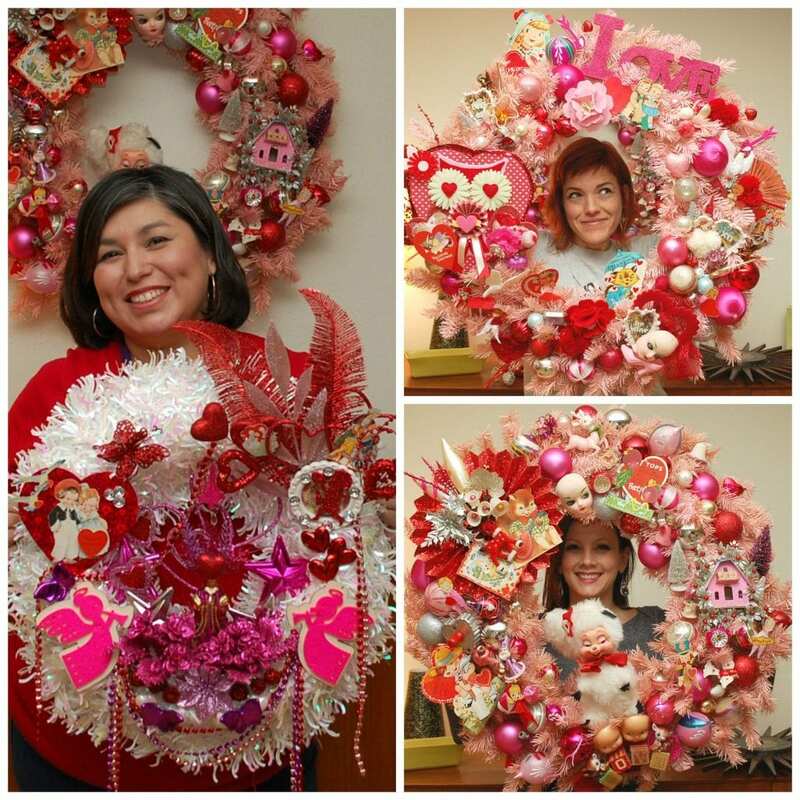 Feast your eyes on these wreaths. I told you my friends were crafty and fabulous. We are already talking about our next wreath making party. Easter, St. Patrick’s Day, Cinco de Mayo – so many choices on the horizon. I need to start digging through the garage again for supplies. Thanks again Treetopia for hooking up my lucky friends with all the amazing wreaths. 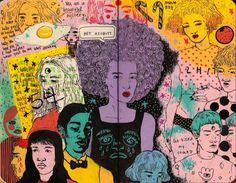 They are hung in some of the best homes in Austin with pride! Posted January 19, 2015 & filed under Holidays, Valentine's Day. How did you start the wreath? On a form? If so, what kind of form?